What I want to do with the Making a Mark segment on IADW, is to start featuring some of the insanely talented people currently living up large on the pages of DeviantArt.com. This should add a bit more colour and spice to the usual showcase of already well-known 'celebrity' artists. Starting today, once a month I'll jump onto D.A, type in a character who I feels lends themselves to great images and hit search. Todays search: Zatanna The catch of the day: A piece by Maia, a 21 year old male artist, from Rio de Janeiro, Brazil. 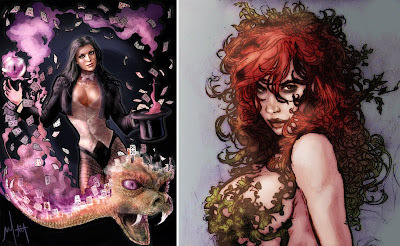 While the art of DC's classiest magician has quite a David Mack feel to it, Maia's small but strong Deviant gallery shows an Adam Hughes-ish style vs. a love of Celtic line-work that is leading to some truly amazing pieces. 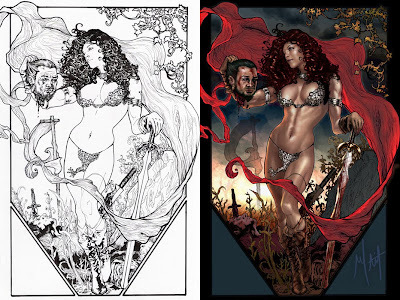 Hopefully he colours the Batman/Poison Ivy piece he has penciled so far, as his style naturally suits this infamous seductress. So see more of Maia's great work click here. How about posting a poll on the best drawn female character? Harley Quin gets my vote! Haven't really done polls on IADW so far Jonny, but that definitely could be an idea for the future. Might pay to make the question 'Who draws the best female characters?' though, as there are some artists that can even make Harley Quinn look like a losing hand!